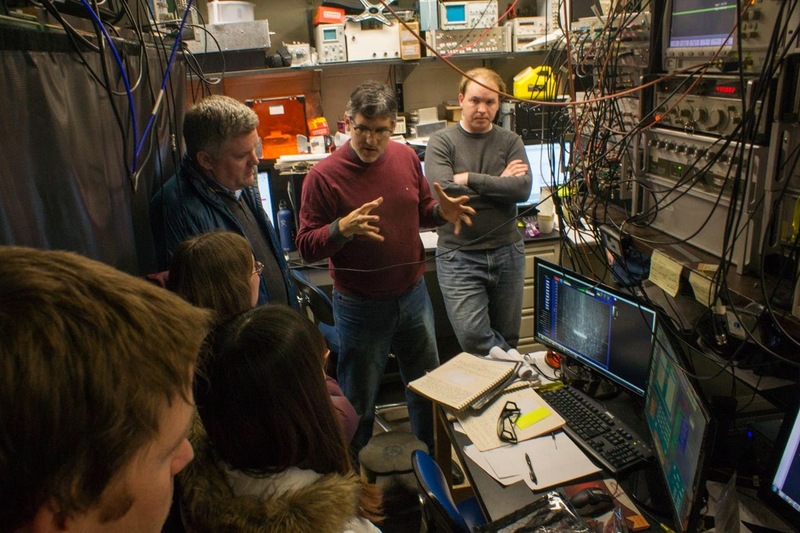 First stop was the lab belonging to Chris Monroe, where he and his team are developing quantum qubits, the fundamentals of future quantum computer processors. Modern computer processors are vast farms of microscopic switches known as transistors made out of a semiconductor material like silicon. A computer uses binary code, long strings of ones and zeroes, to flip these tiny transistors into on or off positions. With properly programmed algorithms, the processor can solve problems and the more transistors in the processor, the faster it is. Introducing quantum qubits into computing would change everything. Instead of transistors only able to be either on or off, qubits can be in a quantum superposition, both on and off simultaneously, which would exponentially increase the computer's processing power. 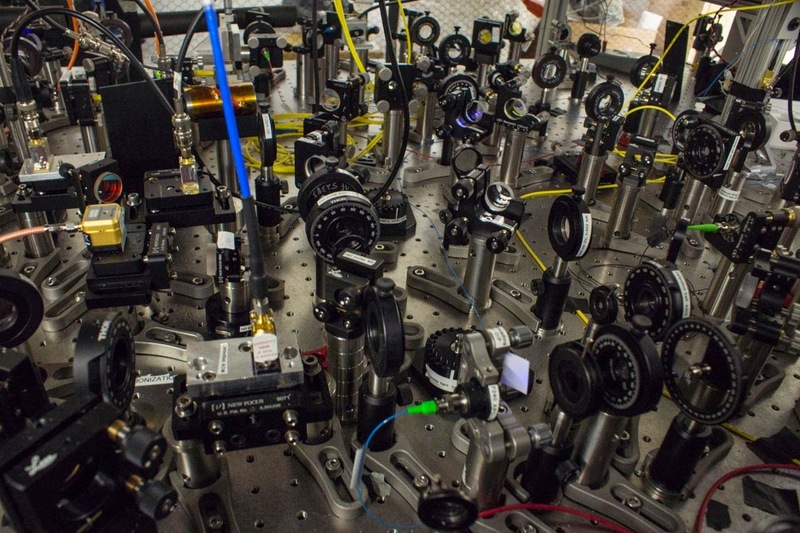 Scientists are are still in the very early stages of getting qubits to work like a processor. 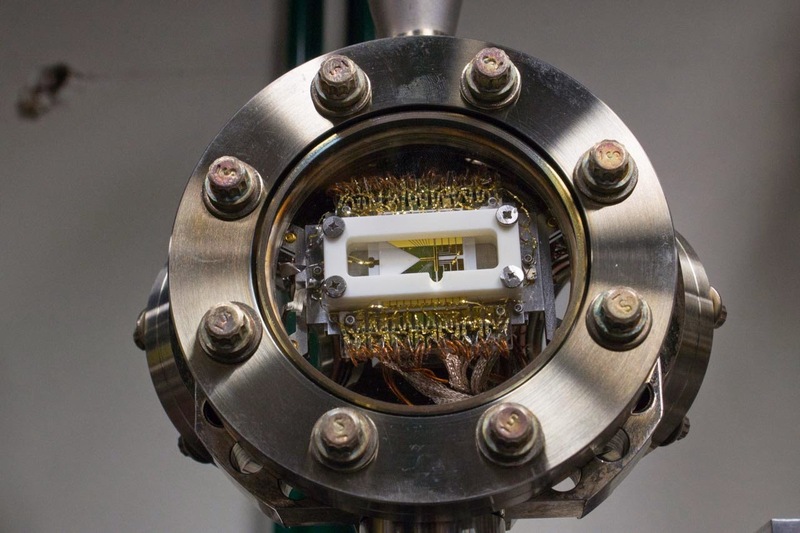 The qubits Monroe is working on are atoms kept in a fragile quantum superposition. However this state is so delicate, that the slightest disturbance collapses the superposition and destroys the qubit. Scientists have to keep the particles in pitch dark vacuum chambers so no light or air molecule can disrupt their delicate system. 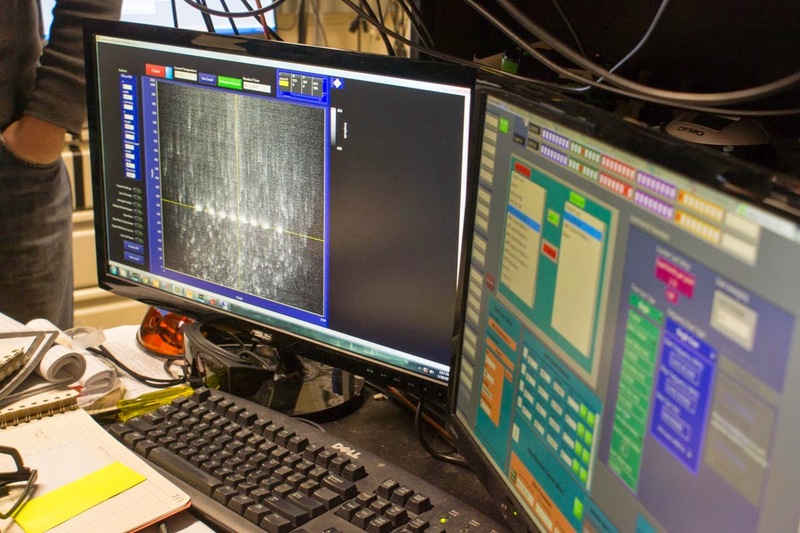 Monroe is investigating ways to manipulate and control ytterbium atoms as qubits and showed us how he used lasers to suspend eight in a line. By carefully calibrating the frequencies of the lasers, he can get the qubits to line up in different patterns. These frequency calibrations have to be precise, exactly right down to the ninth decimal place. On the nearby monitor he showed us the line of qubits. It's an impressive bit of nano-engineering, but how does it someday turn into a future Intel processor? The next lab Monroe showed us has some of the first attempts to start scaling up these foundational experiments into something a little bit more workable. One of the big challenges that scientists are running into is that that of scale. Getting a dozen or so particles into stable superpositons is hard enough, but a working computer processor needs at the bare minimum hundreds to perform any meaningful calculations. 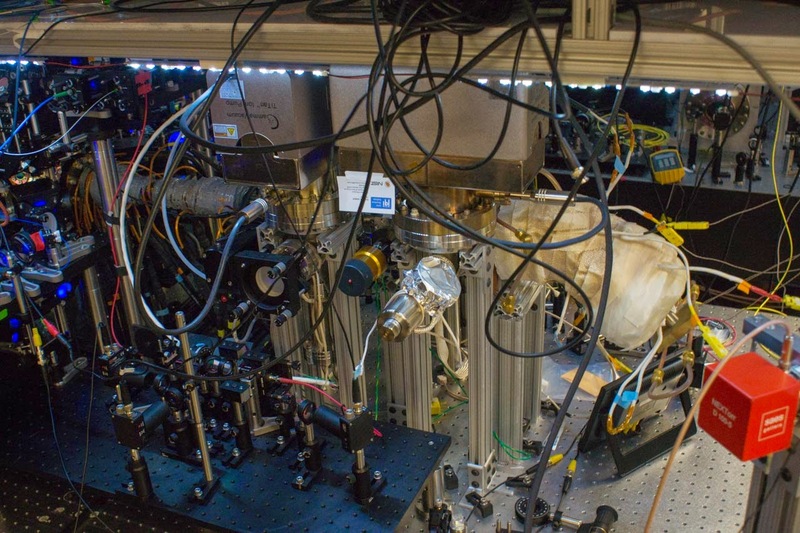 Keeping that many qubits isolated is nearly impossible, so instead of one chamber with all of the qubits in it, Monroe is designing a system with multiple parallel chambers with smaller numbers of qubits so if one breaks down, others can fill in. Each domain only has two qubits in it, but they're all entangled with fiber optics. Theoretically this kind of system could scale up to enormous numbers with huge computing power. Next lab was Edo Waks' where we saw how scientists are experimenting with ways to manipulate a kind of quantum qubits called quantum dots. 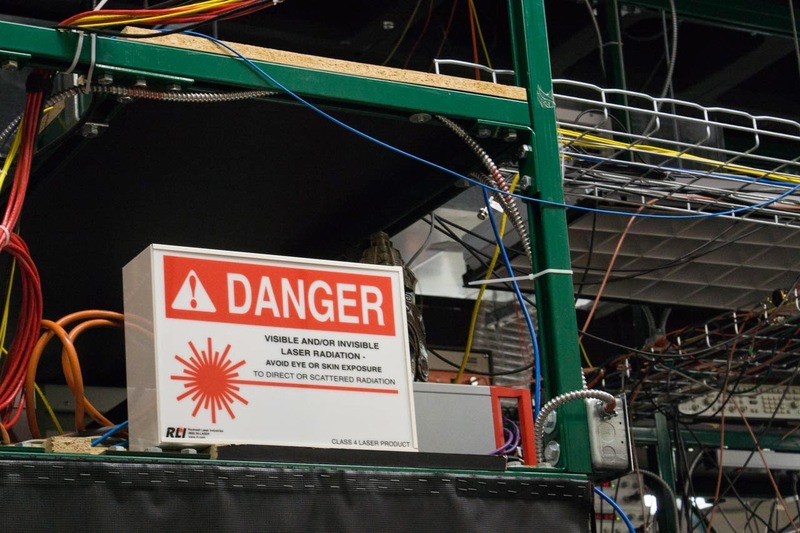 The yttrium atoms in Monroe's lab are great for running experiments to design quantum systems, but it's not practical to have a room full of lasers and vacuum chambers connected up to a commercial computer. The quantum dots of Wak's lab are nano-crystals of semiconducting material that can also exist in quantum states, but can be embedded in a silicon chip, much like the computer processors of today. 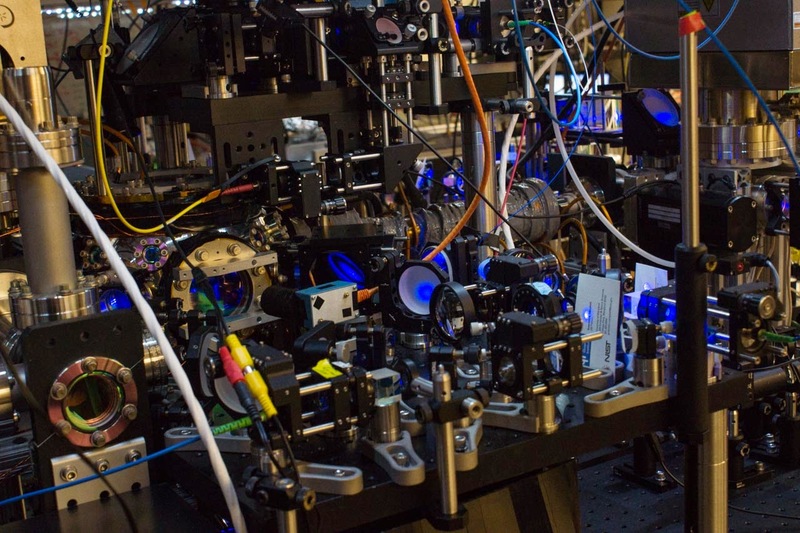 However building a quantum dot processor is difficult because the tools to manipulate and position the dots still aren't really precise enough to build a robust system. 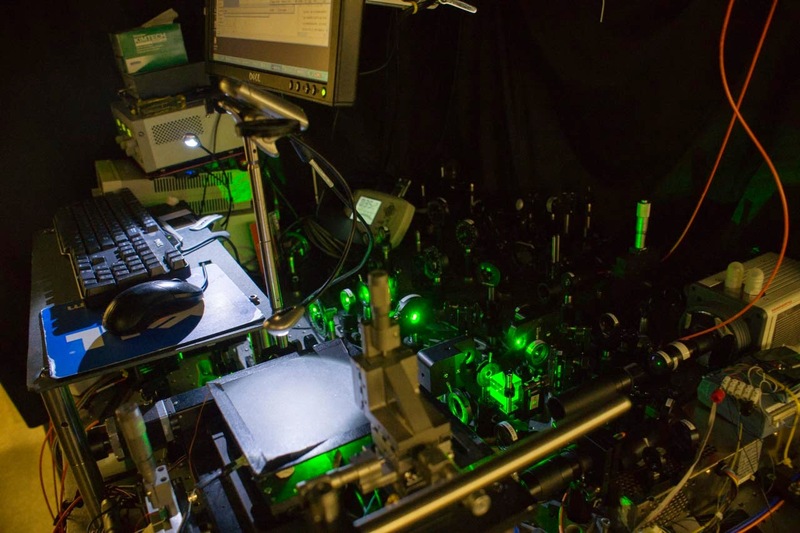 Waks is working on improving the precision of optical tweezers which he uses to move quantum dots around the clover-shaped fluid passages on a postage stamp sized slide. 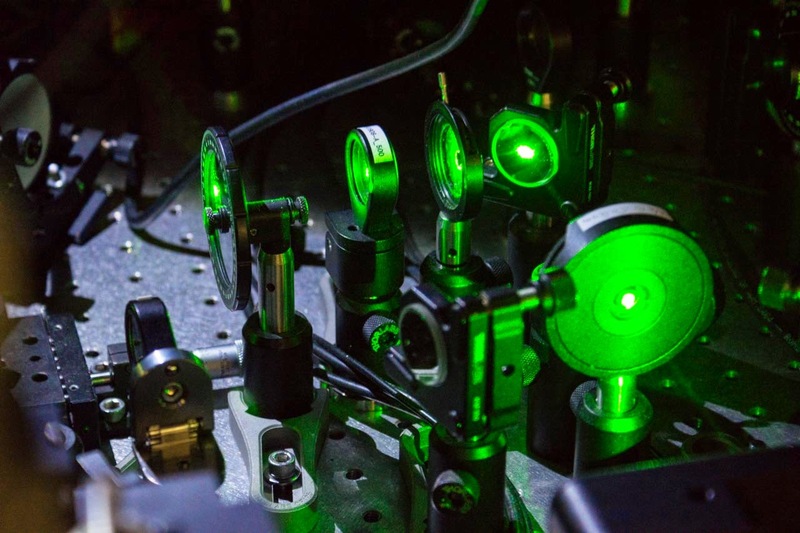 Using green lasers, he can nudge the tiny quantum dots suspended in the fluid and precisely move them around at a rate of about two micrometers per second. 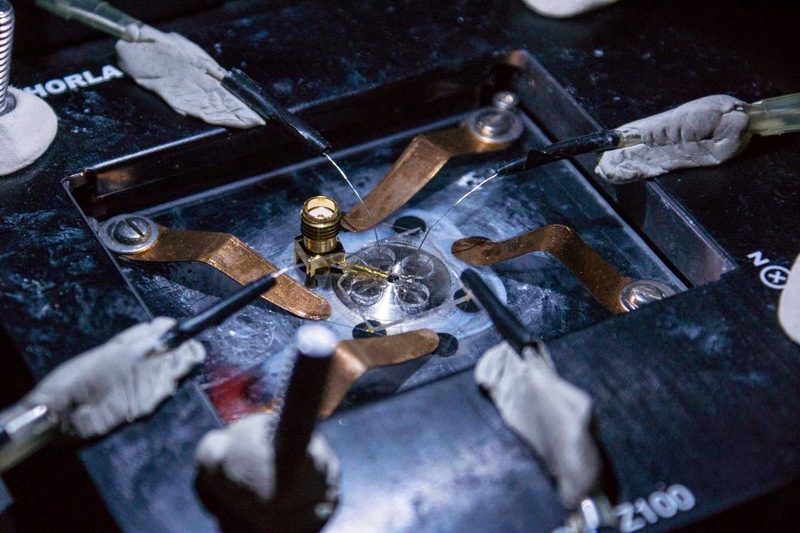 The system he developed is a lot more precise than most other methods, and a version could be used in the future to position quantum dots on silicon chips in some future quantum processor. 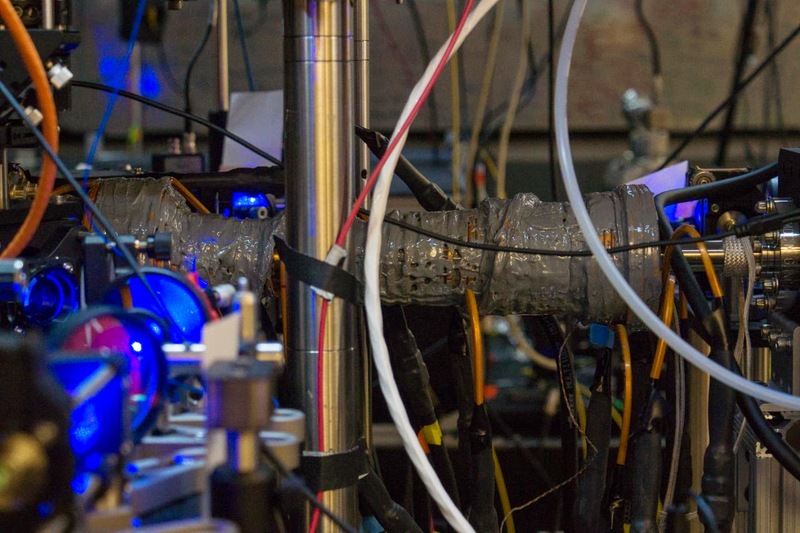 The last lab was Gretchen Campbell whose work is exploring the more fundamental aspects of quantum particles. She specializes in creating and exploring Bose-Einstein condensates, a truly weird quantum state of matter. 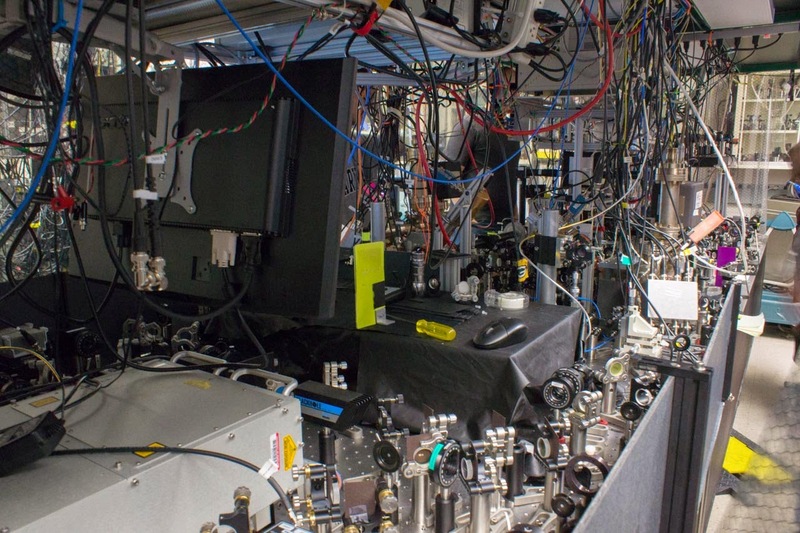 For dilute gases at temperatures just a fraction of a degree above absolute zero, the particles' superpositions start to spread out and overlap and with each other, making and the whole macroscopic gas act like a quantum system. Most of this apparatus is essentially a refrigerator to cool strontium atoms into the near-zero temperatures needed to create a BEC. The process starts with a strontium sample placed inside of an induction oven on the far right of the device. 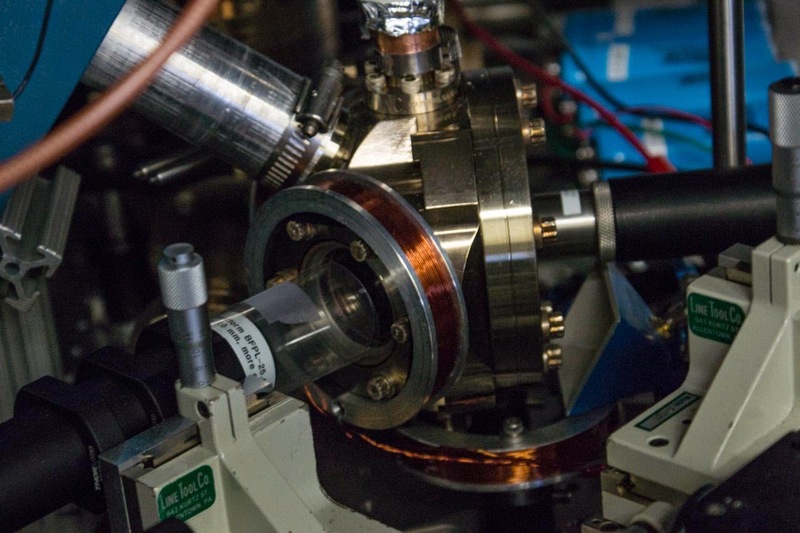 Beneath thick layers of insulation, white-hot induction coils burn off strontium atoms from the sample, which bolt along the length of the device. The heated strontium atoms start shooting down this gray cylinder, called a Zeeman slower at hundreds of meters a second. Lasers and magnetic fields strip most of the energy out of the speeding atoms until they leave the far end of the slower with a fraction of their original energy. The last step of the process is in the vacuum chamber at the far end of the slower. 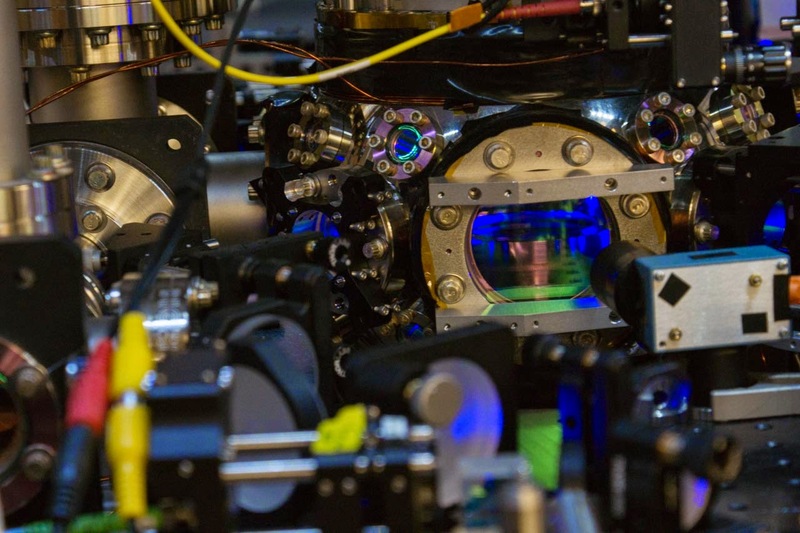 Here a series of optical traps sap the atoms of nearly all of the rest of their energy, and bring them down to their ground quantum states where they coalesce into Bose Einstein Condensates. The whole process takes less than two seconds. Once the atoms are in their ground states, Campbell and her researchers can study the properties of the BEC they created. However, unlike Monroe and Wak's labs, there's no clear plan for what Campbell's team is looking to build. It's research just to understand how this unusual state of matter behaves. There's a chance that some of this work it might apply to building new sensors or creating new superconductors, but really there's no way to know what this kind of knowledge might be used for. Research like this is a big reason that the government created the Joint Quantum Institute in 2006; It's hard to get companies to sponsor research with no obvious commercial applications. Quantum information has the potential to revolutionize computing, but likely only after many years and billions of dollars of investment. 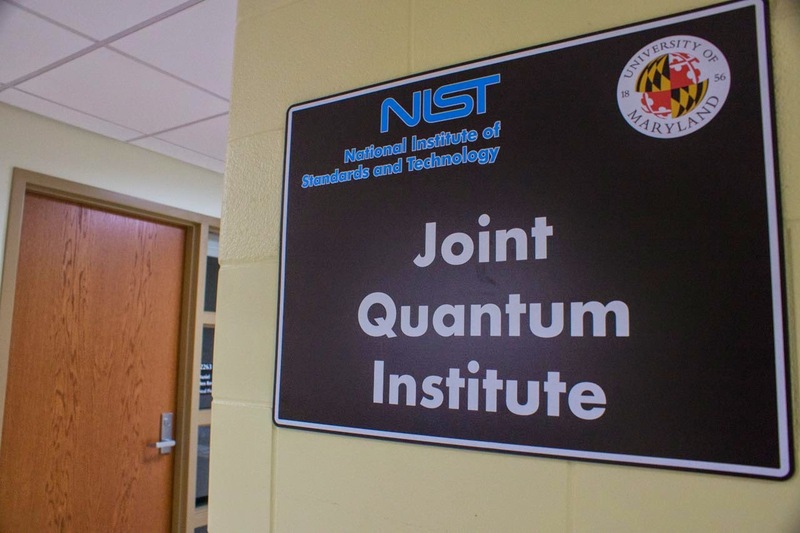 The JQI sponsored by NIST and the University of Maryland, is filling in this research gap and helping to lay the groundwork for future discoveries that could make today's microprocessors obsolete. Great article. So much innovation might start there. I'd rather hire essaystate.net and went there than feel that fail writing paper. is there any website offering free brave frontier cheats and secrets tool for gems .this webpage here is giving coins for the game. Its very useful if every one should follow this ikzhibo.com. for my view is Really nice ofthedarkness. Keep posting the articles,useful to every one thecramatics. its really informative tutorial. Thank you for this tutorial iteratesolutions . The information which you people are given are really superb nagasaki-npo...!!! Diamond Digger Saga Hack Cheats is a tool developed by our finest hackers.It works perfectly on you Andriod ,IOS and Windows devices.It has been an honour for us to provide you this awesome tool for you people.